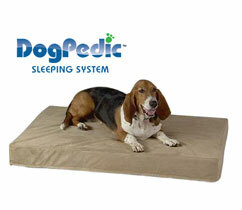 DogPedic is the soft and comfortable memory foam bed for your dog. It is designed to provide your pet the ultimate comfort and support. This bed uses a combination of memory and supporting foam that will conform to your dog’s body, and help support their overall weight. DogPedic will help relieve the pain of arthritis, hip dysplasia, joint and muscle stiffness for your pet. The memory foam material will never lose its shape and will provide years of comfort and support. DogPeid also comes with a Soft Suede Cover that will keep your dog cozy and protects the memory foam bed from normal wear and tear. It has an extra long zipper making it easy to remove and has a non-slip grip bottom that makes it safe to use on all floors. DogPedic is available in three different sizes to fit your dog. Small is for dogs up to 35 pounds, medium is for dogs up to 75 pounds, and large is for dogs up to 150 pounds. The small and medium is only two payments of $19.99 plus shipping and handling. The medium is two payments of $29.99 plus shipping adn the large is two payments of $39.99 plus shipping. As a special bonus, each DogPedic also comes with a free WaterProof Liner. 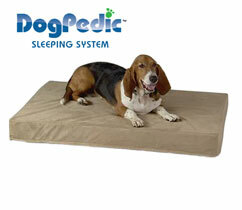 It will help kee thes DogPedic free from stains and odors and also stops liquids from entering the memory foam. what are the actual dimensions of the medium and large bed? The Medium is 37 x 24 x 4 and the Large is 46 x 27 x 4.
sell or ship to PR. I tried to ship it to a relative in Jersey, and…. guess what……my AMEX is not good because the billing address is in Puerto Rico.! I’m really frustrated!!!! !